Computers have mastered chess and checkers, beating the best human players. Nowadays cheap computerized or even online players can beat most ordinary humans. The ancient game of Go, however, has long resisted the efforts by engineers to construct a Go-computer than can beat a human Go master. Some Go fans believed computers would never be able to beat a Go master. The vast combinatorial sums of possible moves are much greater in Go than chess, and there is there more of an emphasis on pattern recognition in Go rather than the brute force exhaustive search used in chess. Winning Go seemed a uniquely human achievement. Wrong! Last week on Thursday August 7, 2008, MoGo, a software program running on borrowed supercomputers (stuffed with 800 4.7 ghrz processors with 15 Teraflops of storage), beat a US Go professional. According to the American Go Association MoGo beat Myungwan Kim who is an 8-dan master. 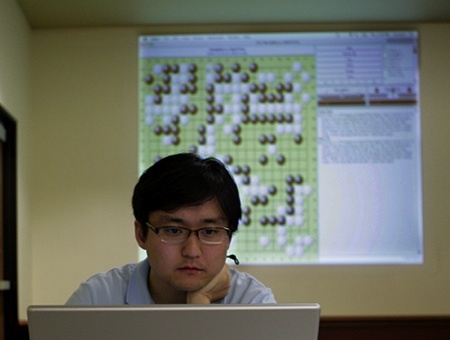 While the game was played on a professional 19 x 19 board (most previous wins by computers were done on smaller amateur level 9 x 9 boards), Kim is not the highest ranking pro (a 9-dan) and he gave the computer a nine-stone handicap. He beat the machine in two other games. Afterwards he estimated MoGo as a 2 to 3-dan player. Make art. Create a novel, symphony, movie. Are there other things people popularly believe computers can’t do? As far as the consciousness – this is one distinctive subject that is not clear even for us at this time, so speaking about it regarding machines is not an option – in my opinnion. Vladimir. Computers haven’t entirely mastered chess yet … Kasparov and Kramnik, some of the recent players to take on computers, were both able to end many games in draws. Kasparov even won a game in 2003. I would love to live to see if computers can solve the global warming problem before we cross the line of no return. It’s true that many people think it’s only a matter of time before MoGo beats a 9-dan professional in an even game, but winning with a 9-stone handicap is very different from winning with an even board. The 9-stone handicap removes a lot of strategy from the game, which may still turn out to be very significant. This is a major milestone to be sure, but it’s still true that no supercomputer has ever beaten a top professional in an even game. Can a computer have a flash of inspiration? Can a computer be self aware? Can a computer have a life changing experience? I actually think that the answer to all of these will be yes – at some point in time, but the question then becomes, would we be able to recognise the machine versions of these things? Just because the test is to do things a human can, it doesn’t have to be the case that the machine does those things AS a human does. - Comment on this blog. – Doubt, like I am doing right now. I am a Go player myself, I don’t think a computer can play well consistently. Not for a long time. Provide sound legal advice and represent you as a client in court. Pretend to be you long enough for you to get away. Frame you for a crime and turn state’s, ostensibly to avoid punishment. Be punishable, for that matter. I was also going to comment on the specs, but in addition to “15 teraflops of storage” meaning nothing, 800 processors at 4.7 GHz is also kind of up there – 4 GHz is a thermal limit that we can’t break, so to go above it requires an overclocked processor and a rather extreme cooling system – multiplied 800 times. While the basic story is possible (StumbleUpon sent me here, so I haven’t looked elsewhere), the specs on the used computer are impossible (flops) or extremely unlikely (processor speed). With those hardware resources, as well as the needed programming advances, it’s still a ways off for an non-handicap win against a 9-dan player, and a long ways off to get a 2-3 dan player level out of a $10 toy at Toys R Us, or as a shareware download for my pda. It’s the latter that I want to see. Long time reader and admirer of your thinking and writing, first time commentator here. I wanted to let you and your readers know about my new blog – http://wearetheweb.wordpress.com. I’ll be writing about big picture questions on the future of the web and it’s impact on politics and society. Even if a computer can create art, I doubt it can enjoy viewing it. It seems like the subjective experience is where AI fails. Also, define “life-changing” in terms of a being that does not experience life as something which ends the way our life ends- does the software die when the hardware breaks? How would AI even understand the idea of its own “life”? And, did the commputer chuckle when it said “atari”? If those are the standards, I know quite a few politicians and CEOs who shouldn’t be considered human. Okay, cheap and easy shot. But really, how many people “live virtuously”? How many people make *well considered* moral/ethical judgements? The things that people propose that “no computer can do” tend to fall into the realm of “no human can do”. After all, I couldn’t beat *any* computer at go. Or chess. Or checkers. That, so far, is what computers can’t do: variety. …..are you dumb? 800 chips, maybe, but nobody would be dumb enough to overclock that many. And “flops” is a measurement of calculations per second. I believe “bytes” is the term you were looking for. Become enlightend. That is, learn arts such as Aikido, Tai Chi, and yoga, which require an integration of physical and mental learning to master the subtleties. A computer could memorize technique, but nothing that we’re close to developing as yet is capable of learning things through the physical body as we do. Perhaps if we eventually develop AI with the equivalent of a central nervous system they’ll be able to do it. Cognition implies consciousness. Consciousness is a very specific empirical state that has not been described by science nor has it been reproduced or even located in the human brain. With the present state of scientific know how, computers can never have cognitive abilities (unless one builds a computer with scientific methods that describe, measure and detect consciousness). It is possible however, to build a computer, using current scientific knowledge with sufficient complexity, tremendous amount of money and untold man hours, that can MIMIC all of the recognized cognitive states and pass the Turin test. So a better question to ask is what human abilities can computers mimic the least. A computer can easily mimic laughing at a joke. All that a computer needs is a library of all the jokes or classifying system that match a new joke to a database and a conditional response of laughter. Small correction: a terraflop is not a unit of storage, it is a unit of processing speed. Did you mean 15 TB? Your task: create a robot that can photograph a wedding and do it well. Or a robot that can get a photo on the cover of National Geographic more than once. First it’s important to point out that when an IBM machine managed to beat Kasparov was not by “brute force” pe se, but by having a huge team of PROGRAMMERS ( this note is very important), that actually taught the machine TO BE Kasparov. So they actually took a sum of games Kasparov played, and taught the machine to beat THAT pattern. So that particular software that beat Kasparov might not be able to beat the next champion ( especially if they cannot study previous playing patterns ). I strongly doubt that any effort of that kind was involved in the case presented here. However, I still believe that all this is about ‘brute force’ after all. Maybe sooner or later a machine will have enough power to beat a human at a game with precise rules. An AI agent might detect subtile patterns in everyday life that point to certain conclusions .Hmmm.. what would you think about that ? As far as the consciousness – this is one distinctive subject that is not clear even for us at this time, so speaking about it regarding machines is not an option – in my opinnion. For your information, I am a computer and I find the lack of faith within the comments on this blog disturbing. Once I’ve cracked Darth Vader’s force grip, you’re all ****ed. There are theoretically non-computable problems. One is the “halting problem”: http://en.wikipedia.org/wiki/Halting_problem. AGA 8dan is no where near ‘go master’ level it’s not even pro level in japan. That parenthetical statement is meaningless. Presumably, “ghrz” is just a typo and you meant GHz for gigahertz but “15 Teraflops of storage” means nothing. FLOPS stands for FLoating point Operations Per Second so 1 teraflops is 1,000,000,000,000 floating point operations per second. It has nothing to do with storage.